We just had a research firm show a historically low level of interest in Apple's newest iPhones at AT&T, Verizon, or Sprint, and now a consumer study comes to reiterate that fact, again for the US. 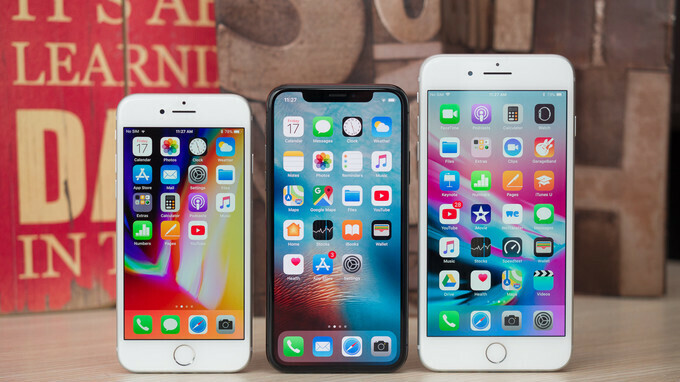 The iPhone 8, 8 Plus, and iPhone X have reportedly represented 61% of all iPhone sales in America last quarter, which is much lower than the 72% that the iPhone 7 and 7 Plus commanded before them. Granted, the iPhone X was quite late to the party, but it seems that people were waiting for it, instead of grabbing the other two, more legacy-oriented iPhones, which resulted in the comparatively slower uptake of Apple's newest darlings. Those same iPhone 7 and 7 Plus accounted for about 25% of iPhone sales in Q4, followed by the 6s and 6s Plus with 8% share, and rounding up the difference was the lowly iPhone SE. The all-important iPhone X made roughly 20% of all iPhones that Apple sold in the October-December period, which means a pretty strong initial demand, but also that the other new iPhones didn't fair as well as they should, or as Apple has been accustomed to. "The all-important iPhone X made roughly 20% of all iPhones that Apple sold in the October-December period, which means a pretty strong initial demand" But they said X is selling badly? It may be selling poorly... by Apple's standards. Of course that means it's still the best selling phone on Earth, just not selling in quite the quantity expected. You mean analysts standards? We have no idea how many Apple expected to sell, only thing what we know is that Apple is expecting last q to be their highest and next month we will hear If they got it right or not. Well that's like comparing apples (no pun intended) to oranges. There's only one iOS company and a ton of Android companies. How about we look at market share? The iPhone X made roughly 20% of all iPhone sales. Previously the iPhone 7 and 7 plus make up 72%, so about 36% each. So the iPhone X is selling just over half as either of those. You can’t compare them like that since iPhone X didn’t go on sale until November. It’s MUCH more expensive than iPhone 6 was. So that comparison is not very relevant either. I paid pretty much twice the money for my iPhone X compaired to what i paid for my iPhone 6. That's bad math because you're assuming Apple is selling the same number of phones year-over-year, which they may not be. Interesting article I saw this morning .. worth reading on NewsWeeks website .. I tried posting the link to the article in here .. but I'm under 30 posts ! LOL But if you go up to NewWeek website .. look for "Is Apple About to Cancel the iPhone X?" Hey PA, why is every other site posting an article regarding the X coming to “end of life” by the summer and you still haven’t? The Pixel 2 Xl and my iPhone 7 Plus are just the best phones out right now. You don’t need to go and by $1000, $900, $800 or even $700 phones. You can pick up a 7 Plus for $400 on Craigslist or OfferUp. The Pixel 2 XL you can pick it up for $600. I just picked mine a 7 plus 256GB model matte black. It's been a month since I owned it. And I loved it! Apple have dropped production from 50 million too 30 million 2 weeks ago. And now dropped again too 26 million. Foxcon have placed 20 million samsung Oled displays on deferral until production is boosted. The iphone BATTERY GATE scandal wil and is costing billions as all those who have and will receive new battery and now can downgrade to 10.3 os as Apple are now Digitally signing the downgrade, this is expected to cost $10 Billion in lost upgrade sales. But the figure looks to be closer to $30 Billion. So please dont tell me Iphone x is the best ever selling iphone. Nor that the company will forever be able to screw consumers without consequences. The reason why the newest iphone didn't sell well is because of the factors such as: 1. Iphone 8 and 8 plus is similar to iphone 7 and 7 plus. So when apple started lowering the price of the 7 and 7 plus. Many have opted to get them as they are the best iphones to owned. 2. Iphone X design and unit was excellent. But the fact that it brittle's so easily is a let down for anyone who accidentally dropped the unit and break the glass on the back. 3. The plan obsolete done by apple also decreases the selling factor of the unit since it slows down the unit until the battery is replaced. But this kind of issue only happens if the iphone user is careless. So for this year. In order for apple to gain consumers trust. They have to remove the throttling(Yet that enable or disable throttling may have some advantage uses after all since it will extend the battery life of the unit when it doesn't needed to run the processor at it's peak. This is similar to android. Sony has stamina mode which when enabled reduces the performance of the processor). Or make some use of it. And they have to re-introduce the iphone by pricing it at a lower price. Also the 7 didn't have iOS 11 and this you still had 32bit app support. Also it doesn't have a glass back, which means that's one last thing to break. Don't have to worry about buying a fast charger. It's also avail in the shiny Jet black too. In years I have not seen careers or third party sellers pushing so hard to sell Iphones. They are giving away deals that are so good, never seen before. It certainly is a fact they don't sell well as expected here in UK. Yet x model is holding 999. I should have mention I didn't mean X phone. Android/Samsung user 4 life, however I would like to try the iPhone 8 in gold one say. It's quite a cute compact phone, and I'm digging the glass body. I would say, every iPhone and iPad Apple releases with the Gold, not Rose Gold and white looks awesome. The 5S, 6, 6S and 7 and 8 all look good with the white and gold. Would love to see one with a black from with the Gold being in the same place and then an opposite one. I always found the white and gold iPhones looked just too elitist for my taste... if I was to get an iPhone, it would be white and silver for me, or possibly white and rose-gold if I felt particularly secure in my manhood. The rose-gold does look awesome, even though it is awfully close to pink.